There's no news like good news. 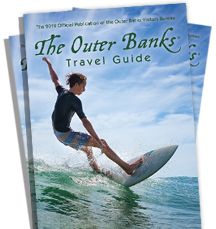 See what others are saying about the Outer Banks. Time "15 Best Mini-Honeymoon Destinations"
Country Living "15 Best Small Towns in North Carolina"
Travel Channel "5 Disney-Inspired Vacations that Aren&apos;t at Disney"
Frommers "20 Best Vacation Destinations"
Travel Channel "Top 10 Beaches in America"
Dating Advice "Couples Relax, Explore and Sightsee at The Outer Banks"
Dr. Beach "5th Best Beach in America"
Travel + Leisure "America&apos;s Most Scenic Waterside Drives"
Travel Channel "Best Drives to Take Your Top Off"
Men&apos;s Journal "20 Best Beaches in America"